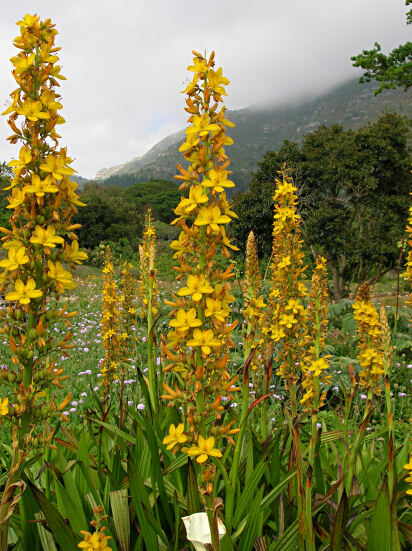 Wachendorfia is a genus of 4 species in the Haemodoraceae family found in the winter rainfall area of South Africa. Some are evergreen and some deciduous. 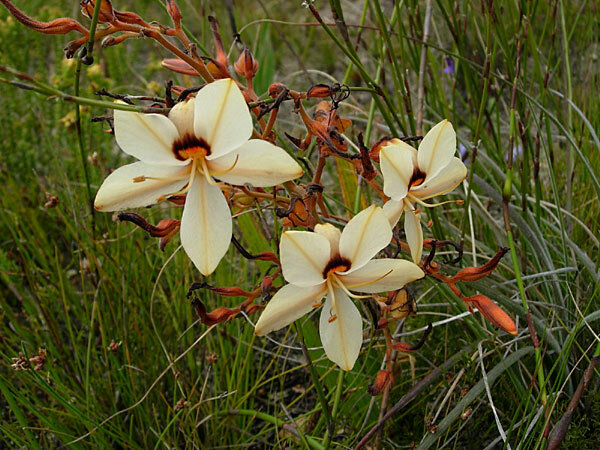 They have bright red rhizomes with papery tunics and yellow to orange flowers with pale to dark markings on the base of the upper tepals. 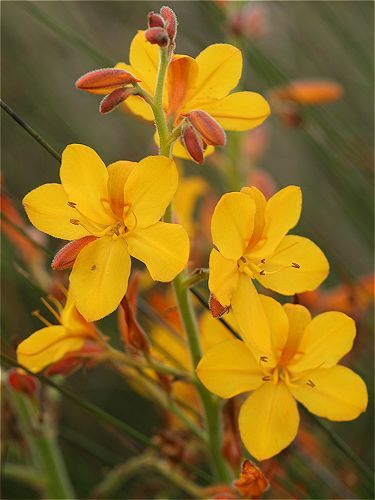 Wachendorfia brachyandra W.F.Barker is a short species with apricot yellow flowers found in sandy places between the Cape Peninsula and Saldanha in the winter rainfall area of South Africa. 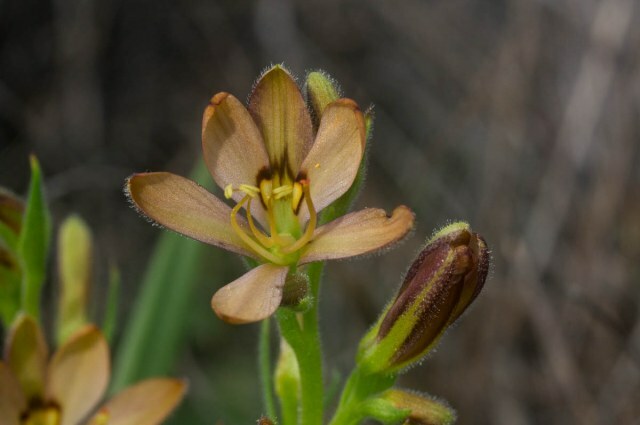 It differs from Wachendorfia paniculata, another short species by having clustered stamens and style half as long as the tepals and flowers that wither shortly before midday. 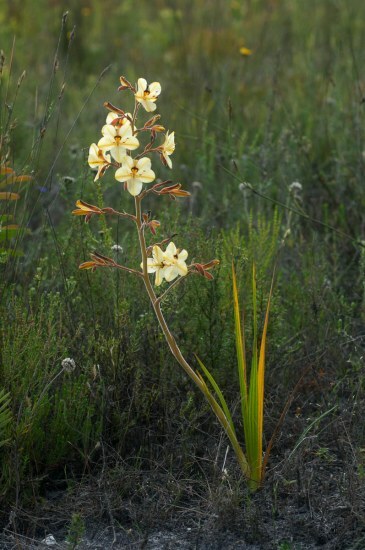 Photographed at Tienie Versveld reserve on August 24 2004 by John Grimshaw. 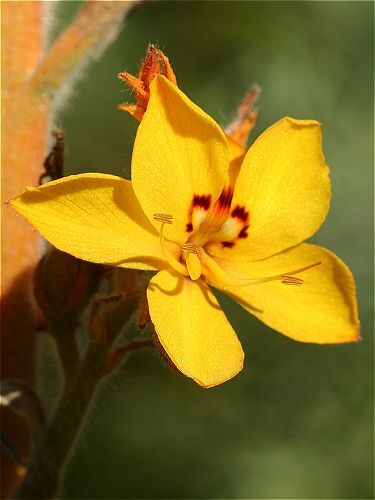 Wachendorfia multiflora (Klatt) J.C.Manning & Goldblatt, syn. 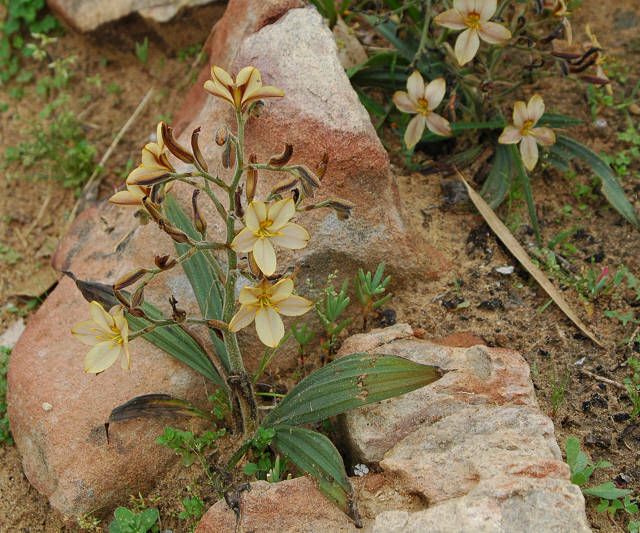 Wachendorfia parviflora W.F.Barker, is a shorter species to 30 cm with dull yellow to brownish purple flowers and grows on sandstone and granitic soils in Namaqualand, the Cape Peninsula and the Karoo. 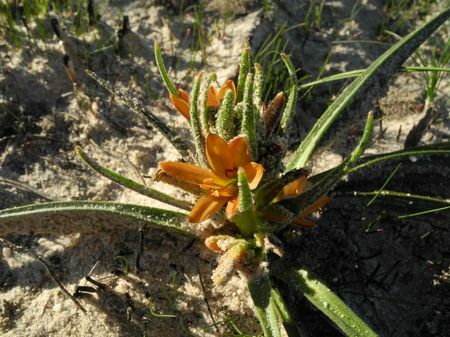 It has narrow tepals and leaves that are lance shaped, hairy and usually longer than the stem. First photo taken near Brackenfell by Mary Sue Ittner and the next two south of Nieuwoudtville by Andrew Harvie. The fourth photo taken by Rod Saunders. 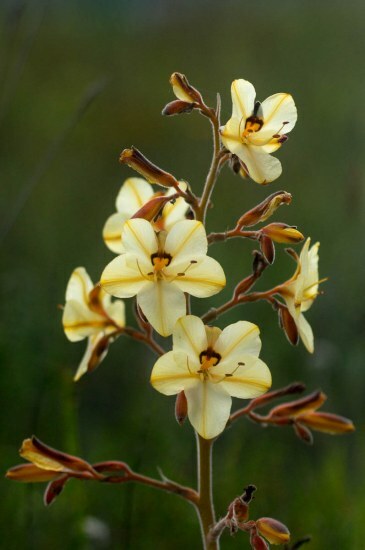 Last photos by Christopher Whitehouse, taken in Phillipskop Mountain Reserve, near Stanford. 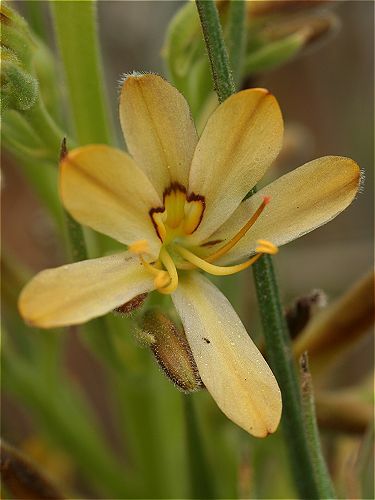 Wachendorfia paniculata Burm. 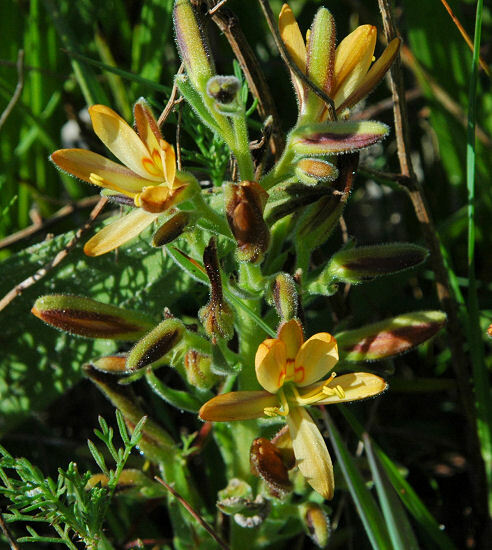 has pale yellow to bright apricot flowers and is found in mainly sandstone soils over a wide area. 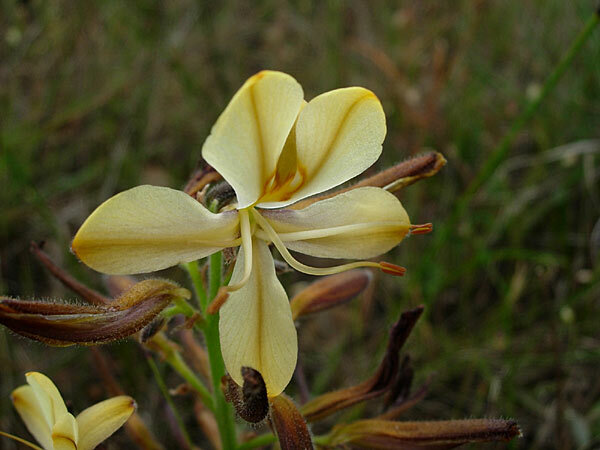 This species which is variable in height from 20 to 70 cm has flowers that wither late afternoon and spreading stamens and styles two-thirds to three-quarters as long as the tepals. 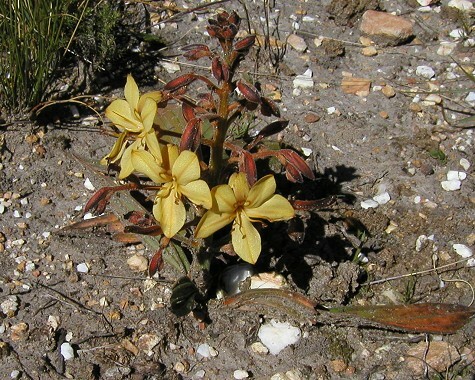 The first picture by Bob Rutemoeller was taken late August 2003 at Boskloof, the 2nd in September 2006 near Clanwilliam by Mary Sue Ittner, and three and four by Cameron McMaster of plants growing in Napier in the Overberg. 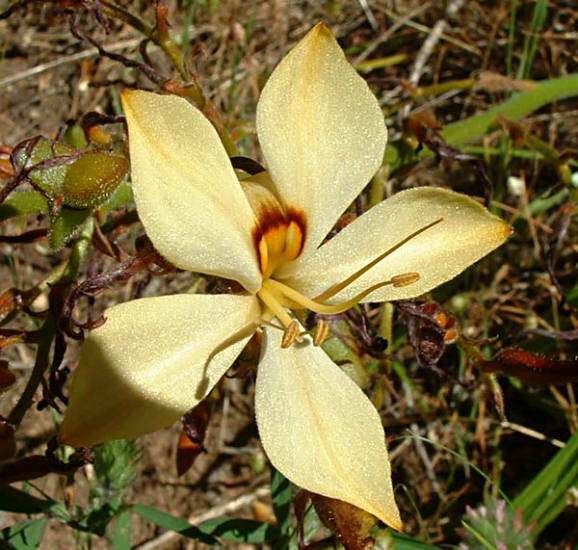 A fifth picture was taken in the hills above Muizenburg, south of Cape Town, in October 2002 by Roy Herold. 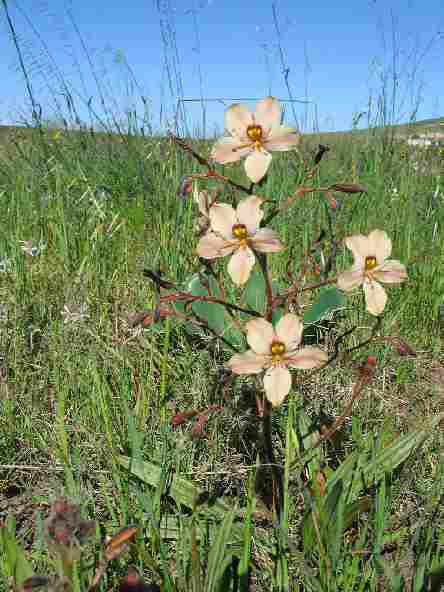 The first photos from Andrew Harvie was taken near Nieuwoudtville. 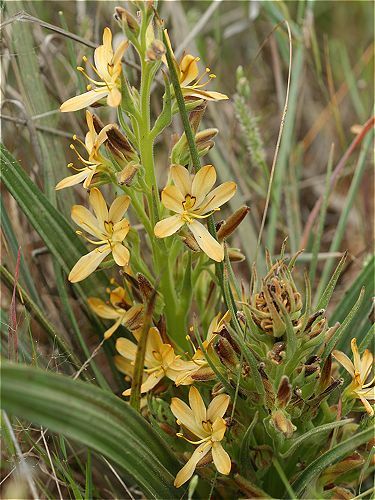 The next two photos from Mary Sue Ittner and Bob Rutemoeller were taken near Clanwilliam where a tall one with bright yellow flowers was growing along the road on a bank. 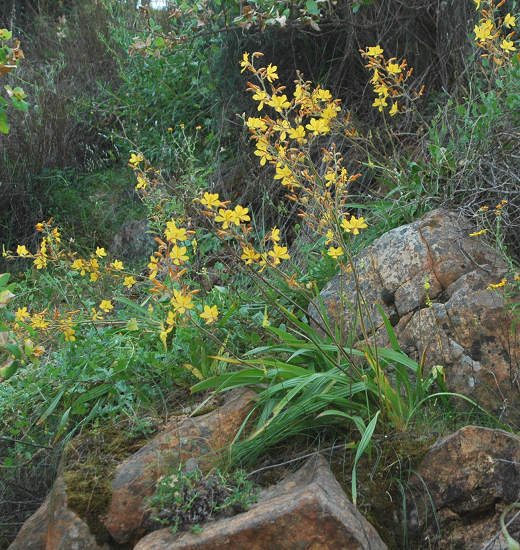 The fourth and fifth photos were taken in Phillipskop Mountain Reserve, near Stanford, by Christopher Whitehouse. 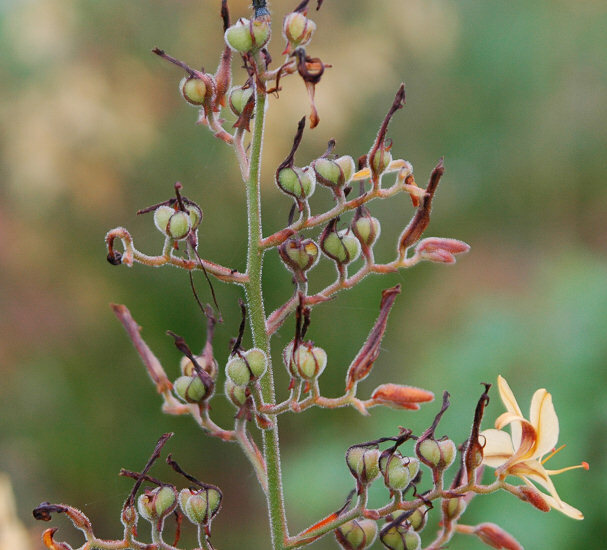 The last photo was taken of seed pods by Mary Sue Ittner. 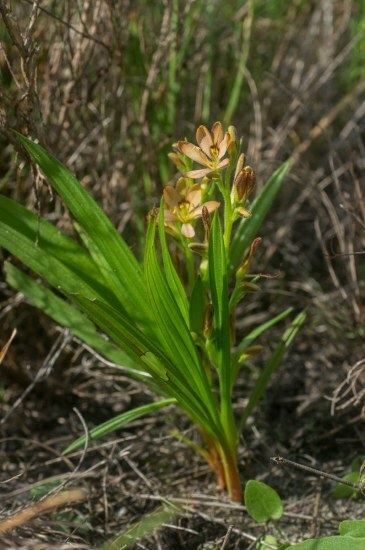 Wachendorfia thyrsiflora Burm. 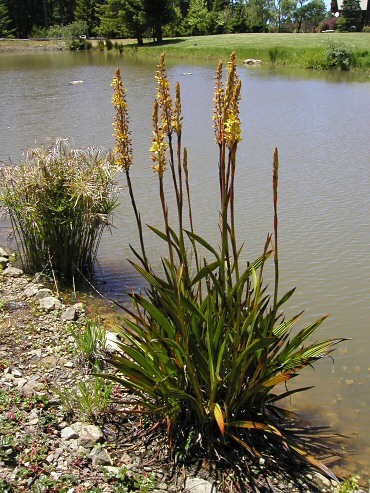 is an evergreen, tall plant found in permanent marshes, streams, and swampy places. 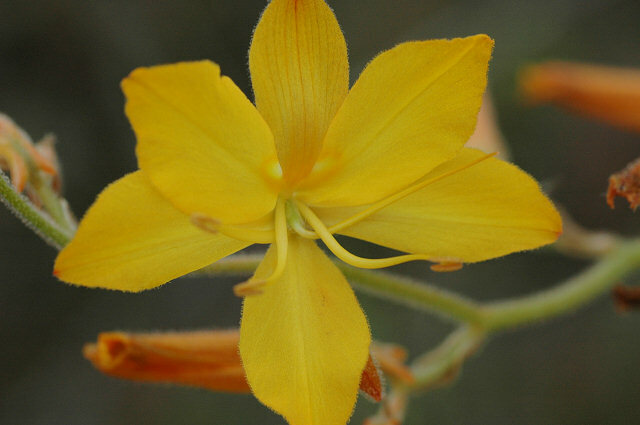 It has a crowded panicle of golden yellow flowers and pleated leaves and a long blooming time. 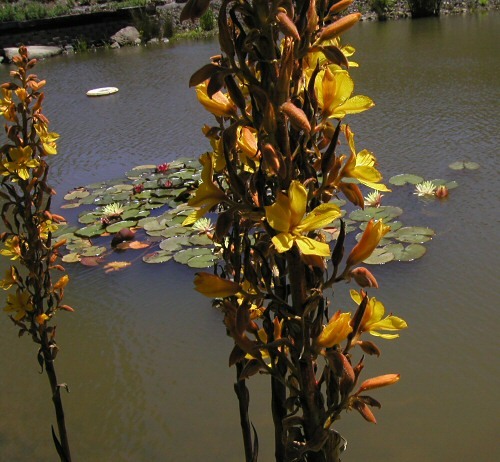 The first two photos are from Bob Rutemoeller of plants growing in Northern California next to a pond and blooming May 2005. Photos number three and four were taken by Alan Horstmann. 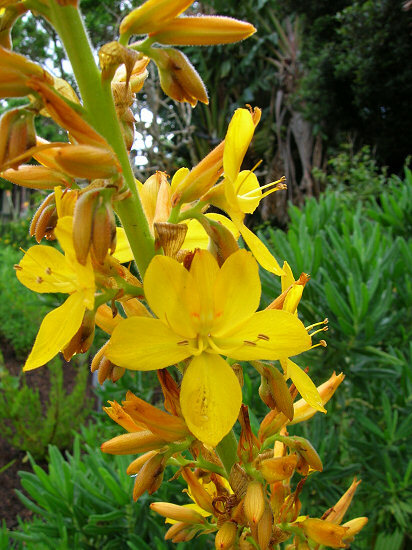 The last photo, a close-up of a flower, was taken by Andrew Harvie near Constantia in the Western Cape.